Bright-orange colored body topped by a tall, firm white head. Fruity nose of grapefruit and organs, with peppery notes of pine. Malt backbone on the palate with some sweetness on the tongue. I’m a big fan of the Great Divide portfolio. Jake showed me the Yeti not too long ago… and it’s amazing! Anyway, today we are sipping on a big IPA called Titan. I wonder if they had the name before they had the ABV. Anyway, I like the Great Divide so let’s see what this one does for my palate. In the Glass: In the glass it looks like a typical IPA. But the head is pretty thick and has a thick and creamy lace. Because of the head, I hope the beer has a thickness to it. It has a big ABV… 7.1%. Let’s see what she smells like. Nose: It’s not as hoppy as I wanted it to be, but it has a subtle IPA nose. I like the hops, but the thickness of the head might be taking some away from the aroma. Plus, it’s right out of the fridge. I bet this heats up nicely. Flavor: The flavor is incredible. There are a few things happening here. First you are hit with some bubbles, then are hit with the sweetness you expect out of a thick brew. Then the hops kick in, but it’s more like a tap… not too strong on the hops. They are subtle and provide a solid transition in to the aftertaste. Mouthfeel: The mouthfeel is great. There is a ton of stuff going on as the beer enters your mouth and moves to the back of the throat. You really do experience a lot as you smell/drink/swallow this beer. Aftertaste: This is a thick beer… and the aftertaste leaves a certain thickness to be enjoyed. There is a hint of dryness on the back of the tongue. It makes me think of a handmade root beer or something. Just as the nose will get better as the beer heats up, I bet the flavors will change too. This is one good IPA. Bottoms up people! 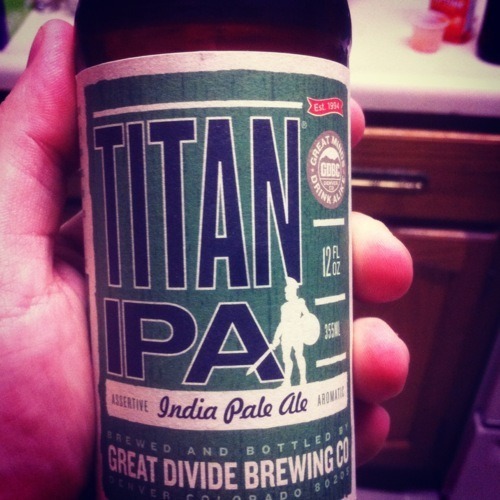 Tonight we are tasting the Titan IPA. I have had a LOT of beers recently, between Winterfest and our visit to Chicago, including Goose Island and Three Floyds. I’m almost beered out. But let’s see what this one’s like. I like the color it pours out into, as well as the fact that it has a very small head. It’s kind of a brownish-red coppery color. It smells almost like a citrusy color, with a hint of cinnamon, maybe. Not the typical strong smell of hops I’m used to from most IPAs. Now to see what it tastes like. Well, the hops are definitely there. But it’s a great balance. There’s just enough hops… this brings me back to the first few IPAs I’ve tasted. What with the seeming onslaught of them lately, I’ve almost grown sick of IPAs. But this one is different. It’s just the perfect balance to me. There’s more flavor besides just hops, and that seems to be what a lot of IPAs are to me lately… a lot of hops. This one I really like. The smell is good, and it has a terrific flavor to it too. This is definitely one beer I’d pick up again if I was looking for an IPA. As Ricky says, bottoms up!